More than 40 per cent of the localities in MMR recorded a positive trend in capital values. Those in central suburbs and Andheri-Dahisar region were the major contributors towards this growth. Multiple flyovers, proposed lengthening of the Santacruz-Chembur Link Road (SCLR) and progress on Chembur-Wadala monorail resulted in a significant rise of seven per cent in average capital values of Chembur in the last two quarters. The SCLR also had an impact on the ‘ask’ rates in Santacruz West, pushing them up to nearly Rs 39,000 per sq ft from almost Rs 36,000 per sq ft in Oct-Dec 2015. Work on multiple metro lines boosted capital prices in areas like Gokuldham, Malad West, Andheri East and Borivali. The rental market of MMR registered a YoY growth of two per cent (Jan-Mar 2016 over Jan-Mar 2015). Localities with rental values lower than Rs 50,000 per month made it to the list of best performing regions. 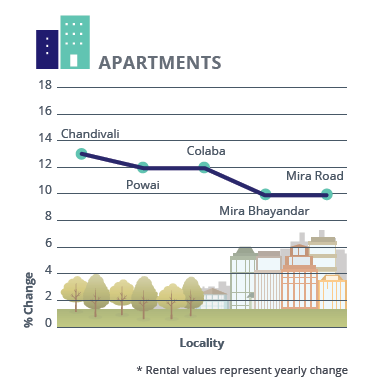 Central suburbs such as Chandivali and Powai topped the rental charts and registered a yearly rise of 13 per cent and 12 per cent, respectively. Affordability drove demand in Mira Road and Mira-Bhayandar Road. These locations recorded an upward trend of 10 per cent each, YoY. 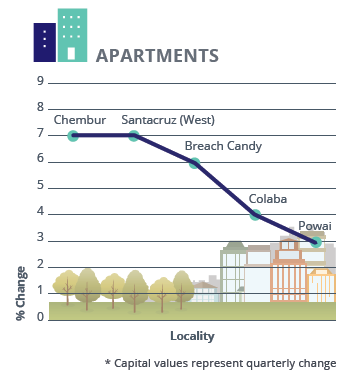 Leasing activity in Andheri and Bandra continued with the same gusto and these localities noted a yearly increase of four per cent each in average rental values. Navi Mumbai has gradually lost its USP of being an affordable alternative to Mumbai with prices doubling in the last few years. The minor fluctuations in the residential capital graph could be attributed to market dynamics. Capital growth in the zone remained stagnant with the highest grossers clocking a rise of just 2-3 per cent in Jan- Mar 2016 against Oct-Dec 2015. Affordable locations such as Khandeshwar and Dronagiri recorded capital growth of three per cent each in property prices. A few transactions that took place in projects by established developers led a rise in capital values across prime areas such as Palm Beach and Seawoods. Both the localities recorded a rise of two per cent each during Jan-Mar 2016 against the last quarter of 2015. Unlike the capital market, which remained under pressure, the rental market in Navi Mumbai showed some promise. Localities away from the city centre, offering cost-effective rental options, witnessed higher demand and posted some yearly growth. Landlords have been exploiting the speculation around the Navi Mumbai airport to quote high rents for quite some time now. However, the market seems to have stagnated, at least in the central parts of the sub-city. Rentals in New Panvel posted a yearly hike of 15 per cent in the last one year. Demand has surged due to affordable rental values in the area. 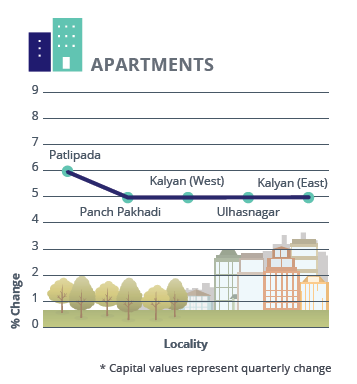 Rental markets of Kharghar, Taloja and Kamothe also picked up steam on the back of relative affordability and registered a 5-12 per cent hike YoY. Infrastructure upgrades instilled signs of revival in Thane and the housing market here has started looking up. Some of the proposed infra projects include the fourth phase of the metro and an underground tunnel from Manpada to Borivali via Ghondbunder Road. Improving connectivity surged the location attrativeness index of localities along Ghodbunder Road. Patlipada and Panch Pakhadi recorded a growth of six and five per cent, respectively in Jan-Mar 2016 over Oct-Dec 2015. 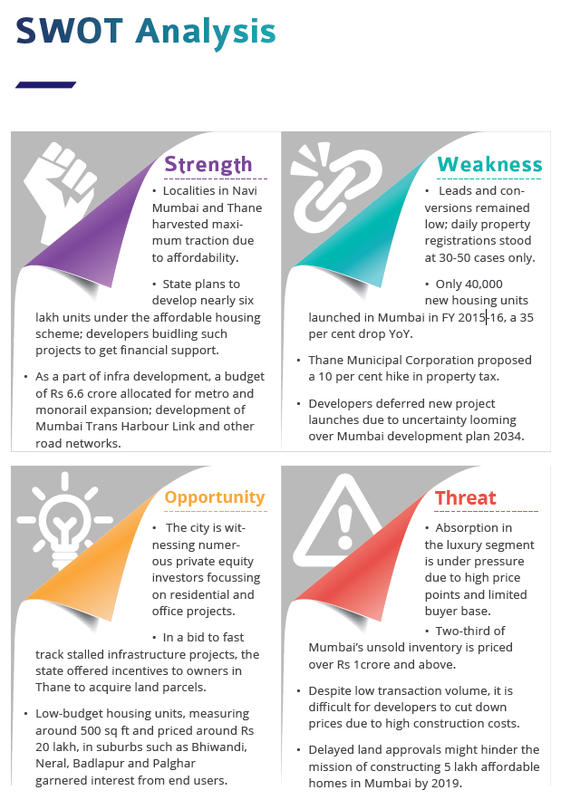 Thane continued to garner steam in the affordable and mid housing segments. Both Kalyan East and West recorded robust demand as values hovered below Rs 6,000 per sq ft. Capital values in the locations grew by five per cent each. Renting a home in Thane has become more financially viable due to soaring capital values. The resultant is a thriving rental market, which has recorded a rise of four per cent in average values YoY. 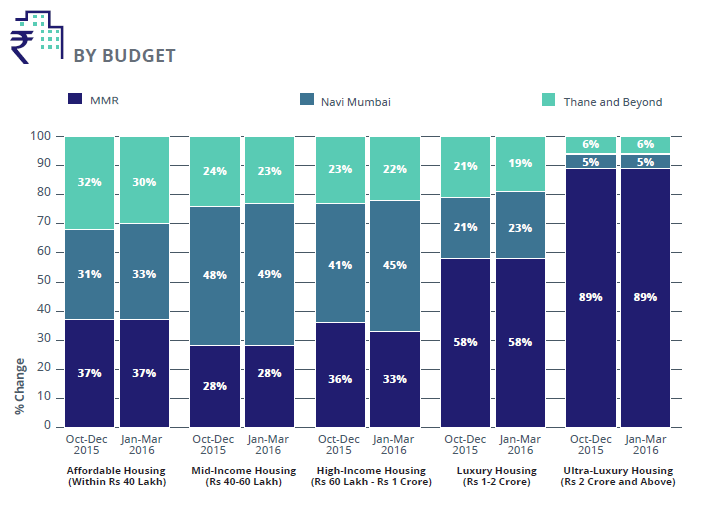 Relative affordability, proposed infra projects and presence of well-endowed projects have enhanced Thane’s rental landscape in the last few years. Similar to the capital market, locations along Ghodbunder Road performed well in the rental segment too. On the back of metro expansion and affordable prices, Kasarvadavali posted a significant rise of 13 per cent in values, while Waghbil noted a modest hike of five per cent YoY. 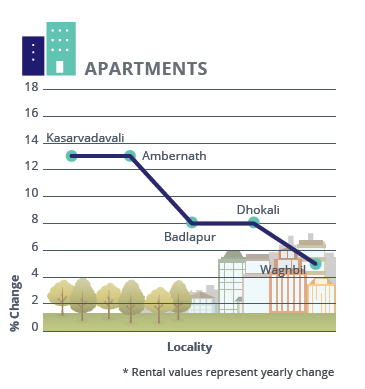 Ambernath and Badlapur recorded a 13 and eight per cent rise, respectively, on the back of affordable rental options. 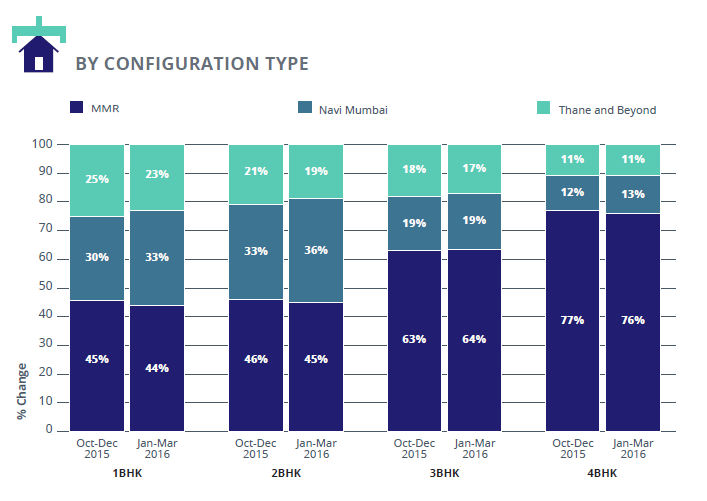 New launches were largely concentrated in the fringes of Thane and Navi Mumbai as developers shifted their focus from luxury properties to affordable and mid-segment housing segments. Small ticket sizes were popular even in MMR, wherein supply of mid-segment properties dropped owing to improved absorption in the segment. Apartments formed the bulk of residential inventory in all zones except Thane and Beyond, where residential land captured more than 60 per cent share of supply. MMR continued to record the highest availability of apartments among all zones. Multiple new launches in Navi Mumbai, particularly in the affordable segment, inched the supply up by one to three per cent in all categories except land. Ready-to-occupy units formed more than 80 per cent of the inventory in the builder floor and house/ villa categories, while only about 60 per cent of the supply of society apartments was ready-to-move-in. Supply has largely remained stagnant in MMR across all budget categories except for properties in the budget range of Rs 60 lakh to Rs 1 crore. A slight drop of three per cent was recorded in this category, indicating a few absorptions in this price bracket in the last two quarters. On the back of several new launches by established developers, particularly in the fringes, Navi Mumbai noted a rise in supply of housing inventory in almost all budget ranges expect for the ultra-luxury segment. A rise of one to four per cent was noted across all categories with high-income housing registering the maximum growth. Affordability ensured healthy traction in locations in Thane and beyond. This coupled with limited number of new launches resulted in a slight drop in housing inventory in Jan-Mar 2016, even though the zone has recorded the maximum unsold inventory. MMR and Thane witnessed a drop in supply of smaller configurations. The supply of 1BHK and 2BHK units dipped by one to two per cent in Jan-Mar 2016 as against the last quarter of 2015. On the other hand, Navi Mumbai witnessed a rise in supply across all configurations. The 2BHK configuration continued to capture the highest market share in both MMR and Navi Mumbai, while 1BHK units were more popular in Thane. Across the city, ready-to-move-in units were more common across all zones as compared to under-construction units. This indicated that new launches are still sparse in the city and sentiments continue to be under pressure for under-construction projects. 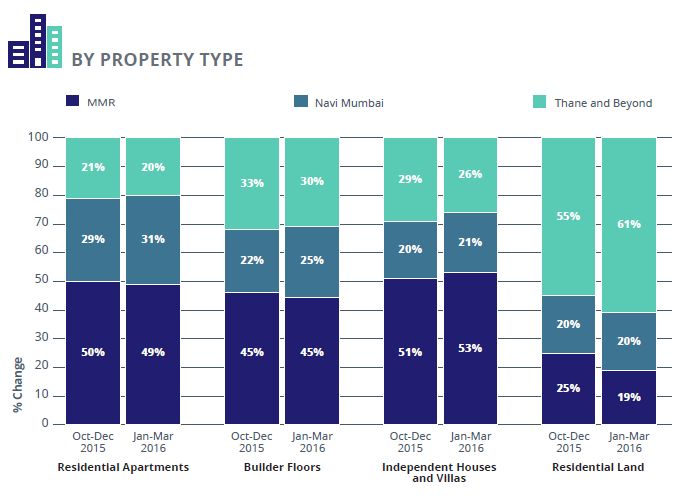 Out of the total ready properties available in Mumbai, almost half were present in MMR. Thane also witnessed a marginal drop in the share of ready units during the first quarter of 2016. 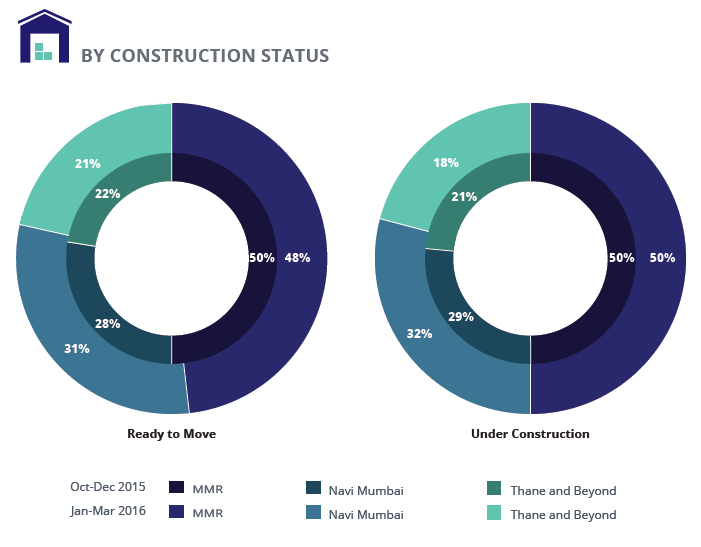 Navi Mumbai registered an improvement in the share of both ready as well as under-construction properties, insinuating a few launches in the city in Jan-Mar 2016.